(Reuters) - On a typical day, Mexican drug lord Joaquin "El Chapo" Guzman would wake at noon and make calls while strolling under the trees in the mountains of his native Sinaloa state, where he was in hiding, a witness recently testified at the kingpin's trial. The infamous gangster's personal life and business dealings have gone on public display since mid-November at a courthouse in New York, where Guzman faces 10 criminal counts and a possible life sentence. The jury will begin deliberations on Monday, after attorneys for the prosecution and defense gave closing statements this week. U.S. prosecutors, who say Guzman amassed a $14 billion fortune through bribery, murder and drug smuggling, supported their case by calling to the stand Guzman's former associates, including one who says she was his lover and another whose brother was among his top allies, as well as law enforcement officers. "Do not let him escape responsibility," Assistant U.S. Attorney Andrea Goldbarg told jurors on Wednesday, standing at a table displaying AK-47 rifles and bricks of cocaine as evidence. Defense lawyers claim the 61-year-old Guzman, whose nickname means "Shorty," was set up as a scapegoat. They attacked the credibility of witnesses, many of whom have extensive criminal histories. ** Guzman's voice was "sing-songy" with a "nasally undertone," said FBI agent Steven Marston. In one recorded call, Guzman tells an associate, "Don't be so harsh... take it easy with the police." The partner responds: "You taught us to be a wolf." ** Text messages between Guzman and his wife, Emma Coronel, often turned to family matters. "Our Kiki is fearless," Guzman wrote in one, referring to one of their daughters. "I'm going to give her an AK-47 so she can hang with me." ** After Coronel said she saw a suspicious car, Guzman wrote to her, "You go ahead and lead a normal life. That's it." Later he reminds her: "Make sure you delete everything after we're done chatting." ** In one of the trial's final days, Guzman told the judge he would not testify in his own defense. The same day, he grinned broadly at audience member Alejandro Edda, the Mexican actor who plays Guzman in the Netflix television drama "Narcos." ** Multiple "wives" visited Guzman when he was hiding in Sinaloa, said Alex Cifuentes, a former close partner. 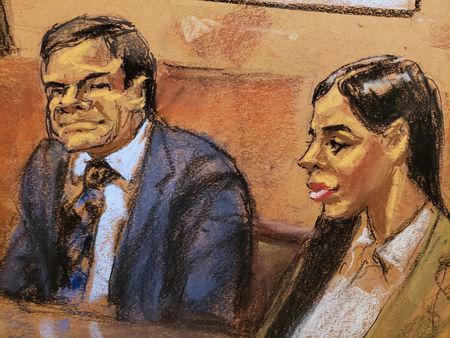 ** Lucero Sanchez Lopez, a former Mexican lawmaker, told jurors she once had a romantic relationship with Guzman, who sent her to buy and ship marijuana. "I didn't want for him to mistrust me because I thought he could also hurt me," she said. "I was confused about my own feelings over him. Sometimes I loved him and sometimes I didn't." ** Agustina Cabanillas, a partner of Guzman who called him "love," set up drug deals by passing information between Guzman and others. In one message, Cabinillas called Guzman a "jerk" who was trying to spy on her. "Guess what? I'm smarter than him," she wrote. ** Guzman's Sinaloa Cartel paid bribes, some in the millions of dollars, to Mexican officials at every level, said Jesus Zambada, the brother of Ismael "El Mayo" Zambada, who worked alongside El Chapo and is still at large. ** Beneficiaries included a high-ranking police official who fed Guzman information on police activities "every day," said Miguel Angel Martinez, a former cartel manager. ** Guzman once paid $100 million to former President Enrique Pena Nieto, Cifuentes said. Pena Nieto has denied taking any bribes. ** When imprisoned in Mexico in 2016, Guzman bribed a national prison official $2 million to be transferred to a different facility, but the move was unsuccessful. ** After a rival cartel member declined to shake Guzman's hand, he ordered the man killed, fueling a war between the cartels, Zambada said. ** When assassins reporting to Guzman killed a police official who worked for a rival, Zambada said, they lured him out of his house by pretending they had hit his son with a car. ** Guzman ordered Cifuentes to kill the cartel's communications expert after learning he was cooperating with the FBI. But Cifuentes said he was unable to carry out the hit because he did not know the man's last name. ** When Damazo Lopez Nunez, a top lieutenant to Guzman, told his boss that a Mexican mayor wanted them to "remove" a troublesome police officer, Guzman told him they should do her the favor because the mayor was a favorite for an upcoming state election, Lopez testified. He said Guzman told him to make the killing look like revenge from a gang member. ** Lopez also said Guzman's sons killed a prominent reporter in Sinaloa because he published an article about cartel infighting against their wishes. ** One of Guzman's former bodyguards, Isaias Valdez Rios, said he watched his boss personally kill three rival cartel members. Guzman shot one of them and ordered his underlings to bury the man while he was gasping for air. On another occasion, Guzman tortured two men for hours before shooting them each in the head and ordering their bodies tossed into a flaming pit. ** For a period of Guzman's time as a fugitive in Sinaloa, in northern Mexico, his posse lived in "humble pine huts" with tinted windows, satellite televisions and washer-dryers, Cifuentes said. About 50 guards formed three rings around the homes to keep watch. ** Guzman escaped into a tunnel hidden beneath a bathtub when U.S. agents raided one of his homes in 2014, said Sanchez, his lover. She followed Guzman, who was completely naked, into the passage, feeling water trickle down her legs. "It was very dark and I was very scared," she said. ** Guzman's wife helped her husband tunnel out of a Mexican prison in 2015 by passing messages to his associates, Lopez testified. She unsuccessfully tried to help him duplicate the escape when he was captured the next year.